International lawyer Philippe Sands has a unique insider's view of the elites who govern our lives. His sensational revelations in Lawless World changed the political agenda overnight, forcing Tony Blair to publish damning mterial that he'd tried to hide. Now, in this updated edi... read full description below. International lawyer Philippe Sands has a unique insider's view of the elites who govern our lives. 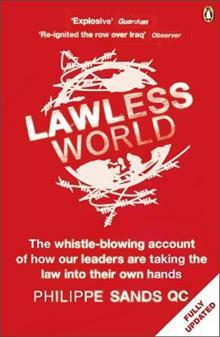 His sensational revelations in Lawless World changed the political agenda overnight, forcing Tony Blair to publish damning mterial that he'd tried to hide. Now, in this updated edition with a shocking new chapter, you can get the full story of how the US and UK governments are riding roughshod over international agreements on human rights, war, torture and the environment - the very laws they put in place. Here sands looks at why global rules matter for all of us. And he powerfully makes the case for preserving them ...before justice becomes history.